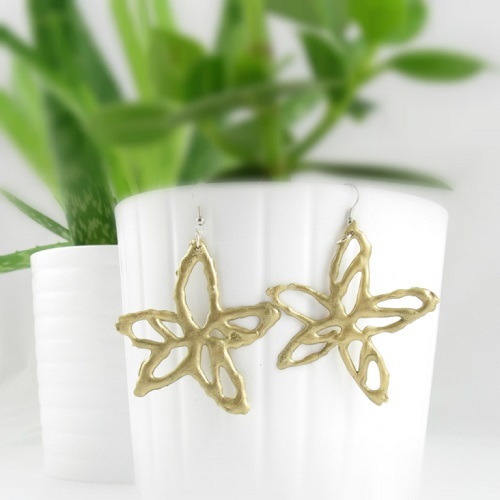 3 Glue Gun Earrings Tutorials for Some Summer Fun! Christina, who is the blogger behind Imagine Hearts, loved her rubber flower earrings which she bought while on holiday. These were the inspiration behind her glue gun flower earrings tutorial. They are not copies of the original just funkier versions. And like her original pair, the glue gun ones are also soft and flexible. Not to mention light! She also has a video tutorial showing how she made it. She used nail polish to color the glue gun earrings. But you can also use other paints. This project certainly gives one ideas for doodled designs! Tatiana Andreeva of DIY Crafts TV found a creative way to make watermelon slices using a glue gun! Again, the final pieces are colored with nail polish. Use other paints especially if you do not have green! Danrie, an Australian arts and crafter, used a silicone mold for her glue gun earrings. Those of you who are still leery about using resin, take note of this tutorial! Was just sitting here thinking of resin and how I can't use it in my studio. Perhaps glue gunning is the way to go!? Yes!! You can use glue in silicon molds too! Probably not for crystal clear designs. Quite right, Valerie! It is amazing what colors there are these days.